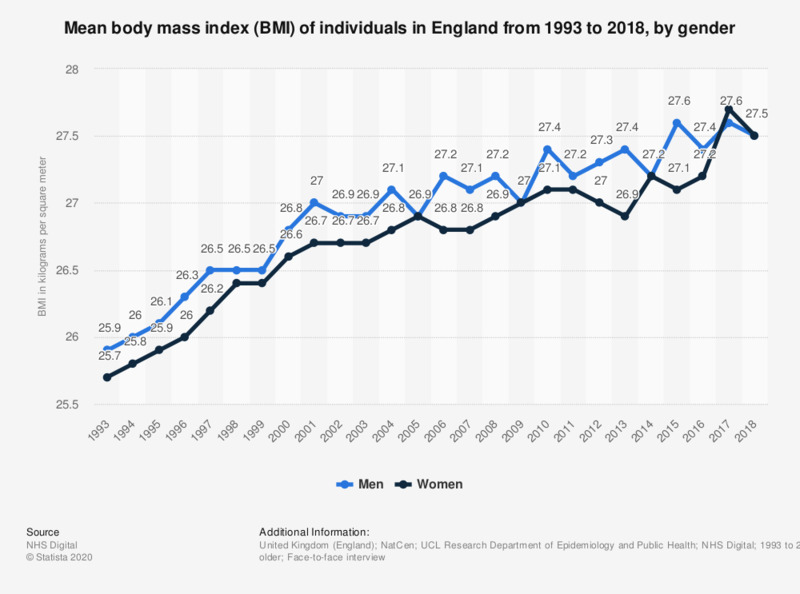 This statistic displays the interviewer-measured mean BMI (body mass index) of individuals in England from 1993 to 2017, by gender. In the year 2017, the mean interviewer-measured BMI of women was 27.7 kilograms per square meter. Based on those with valid height and weight measurements. - All young adults from core and boost samples in 2002 were included in analysis of those aged 16-24 but only the core sample was included in the overall total. Thus it should be noted that the 'All Men', 'All Women' and 'All adults' totals are not the sum of the individual age groups. - Data up to and including 2002 are unweighted; from 2003 onwards data have been weighted for non-response. - All adults from core and boost samples in 2005 were included in analysis of 65-74 and 75+ age groups but only the core sample was included in the overall total. Thus it should be noted that the 'All Men', 'All Women' and 'All adults' totals are not the sum of the individual age groups.